Raversyde’s core is the former Royal Domain of Belgian King Leopold II, who obtained several plots of land in Raversyde from 1902 onwards and ordered the construction of a wooden chalet on these lands. This 'Norwegian Chalet' was built in 1904, but disappeared barely ten years later when the Germans turned the domain into a coastal defence battery. During the Second World War the area was included in the well-known 'Atlantic Wall'. The events have left deep traces at the site. After his regency Prince Charles settled in Raversijde on a permanent basis. He sold his domain to the Belgian authorities in 1981. In 1986 the Province of West Flanders announced its desire to take care of the layout and management of the former Royal Domain of Raversijde. Everything was restored thoroughly in cooperation with the Coastal Port Division and the Buildings Agency. In the meantime the Flanders Heritage Agency conducted research on the location of medieval Walraversijde. The Prince Charles Memorial was opened to the public in 1992. 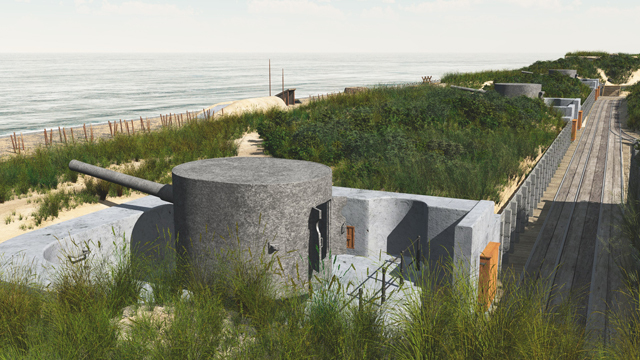 A first opening of the Atlantic Wall site with the Aachen battery took place in 1993, followed by a full opening with the Saltzwedel Neu battery in 1995. The archaeological site with four reconstructed medieval houses and an interactive museum was opened to the public in 2000. The preparation of a regional strategy for the Provincial Domain of Raversyde by order of the Provincial Government of West Flanders started in early 2011. A harmonic park management plan and a museum study were prepared simultaneously. The Province of West Flanders wants to turn the provincial domain into a public-friendly heritage site in a scenic area and an important all-weather visitor draw at the Belgian coast. The new names and logo were launched in the spring of 2013. The Provincial Domain of Raversijde was renamed Raversyde. Raversyde includes the Atlantikwall, ANNO 1465 and the Scenic Park.